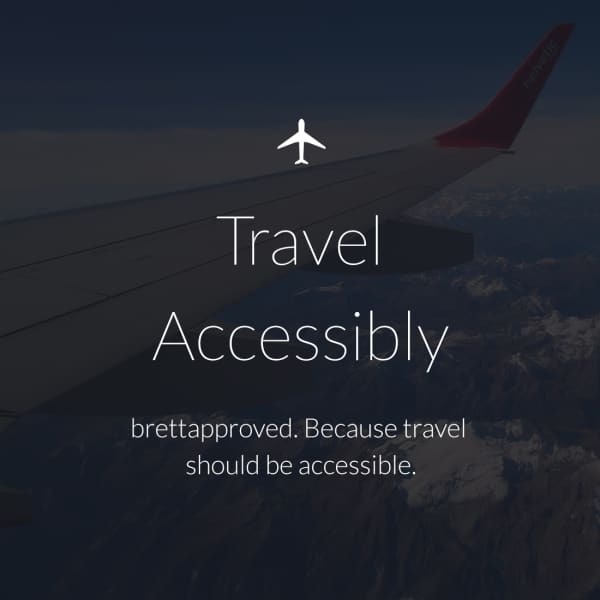 brettapproved is a travel and entertainment website for people with physical disabilities or anyone with a mobility challenge, that lets us review and rate hotels, restaurants and entertainment venues. Do you have plans to review places in other cities around the country? Yes. But we’re not stopping there! How does the brettscore work? It’s an algorithm that you can influence with each review. How can I become a brettapproved reviewer? Every member of the brettapproved community is a reviewer. You can be one, too! Just sign up here to be a member now. I want to get more involved – how can I become a Certified Reviewer? If you travel locally or globally and you’d like to be a Certified Reviewer, we need you! Certified reviewers are a cut above. They are super dedicated brettapproved community member volunteers who love to share the best the world has to offer with people who care and are grateful for their info and advice. Certified Reviewers are excellent writers who find humor, joy, and beauty in everyday adventures and have a flair for life-hacking that enables them to find ways to optimize every restaurant, hotel, and travel adventure. Our process for identifying people with the qualifications to be a Certified Reviewer is pretty simple. Write at least five super-useful, thorough reviews of venues you frequent and upload them to brettapproved.com. Don’t get distracted. Focus on the accessibility of the architecture, landscape, neighborhood, and transportation. Highlight whether the staff had positive can-do attitudes and a willingness to accommodate you. Mention the focus of your review at the beginning. Is this a great place if you’re in a manual or motorized wheelchair? If you are sight or hearing impaired? If you have food allergies? It’s important for your readers to know ‘where you’re coming from’. Be positive. brettapproved.com is not a complaint site. We’re here to celebrate and share what does work. We know there are plenty of places that don’t, but that’s not useful info. Help your fellow brettapproved community members discover the best places that do work and share the info we need to get the most out of our visit. Don’t rule places out. Just because it’s got a low brettscore doesn’t mean we shouldn’t go. If you go hang gliding, we want to know about it! And more importantly, we want to know about the company you use to get you up in the air and off the ground when you land. Great adventures are what we’re after, so share how you get around the world and the best places and companies that make it possible. Share tips that make things possible. If your favorite restaurant is wheelchair accessible, but the restrooms aren’t, share tips on where to go nearby before we arrive or after we leave. Where there’s a will, there’s generally a way. We’re counting on our Certified Reviewers to be pros at finding ways to get the most out of every day and every trip. Be particular. Certified Reviewers don’t just know great places and how to enjoy them, they know how to tell the story. Show us your creative writing skills as well as your reporting skills. Write skillfully, pay attention to grammatical details, and be sure to spellcheck your review before uploading. Certified Reviewers can use their published work on brettapproved as part of their resume to obtain other writing jobs. We take our review process seriously. If you are selected to be a brettapproved Certified Reviewer and need a reference, we’ll be happy to provide one.